The only complete aircraft built at ABC Motors. 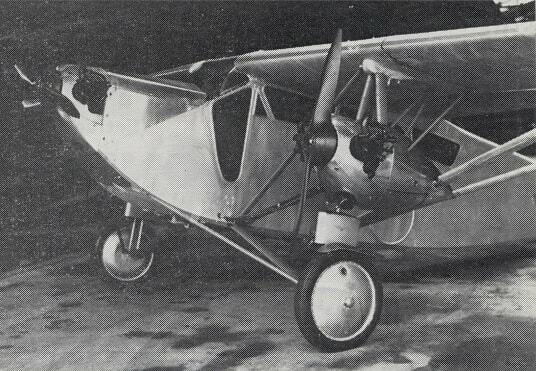 The "Robin" with "Scorpion" engine, 1929. At this stage it should be pointed out that A.B.C. engines were not only installed in A.B.C. cars. Marcel Leyat, who designed the propeller-driven Leyat car, used an A.B.C. car engine, known as the Scorpion, in his Type 2 H. car, and at least one of these exists in the Le Mans Museum, donated by Mons Gustave Courau, who bought the car when new (actually the first Leyat sold). Anyone interested in these vehicles should obtain a copy of Les Automobiles a Hélice by Gustave Courau, which fully describes and illustrates them. Monsieur Andre Jacquemin also had a Leyat with A.B.C. engine, which he kept for some years before removing the engine and installing it into a hydroplane which he had designed. This did not prove too successful, and once more the engine was removed and this time fitted to various Leyat-Jacquemin light aircraft. In all, this engine survived from the early twenties to the late thirties, when attempts expired. An Archer car was also designed in France, also propeller driven, and again at least one exists, but whether this used an A.B.C. engine I have yet to find out. 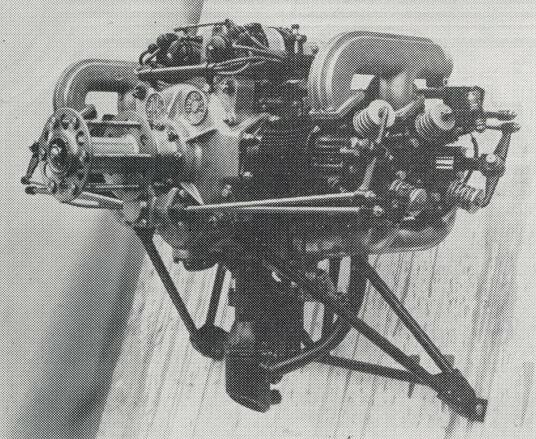 A car engine was installed in the Passat Helithopter, built by Mr. Passat of Wimbledon. He was one of the less-successful inventors early on in the aviation field, tending to adhere to designs incorporating flapping wings. These having failed, the helithopter was constructed with the help of his wife and family, who cut out the canvas shapes for the wings and sewed them together. Two sets of wings revolved in opposite directions, powered by the A.B.C. engine, but when tried out on Wimbledon Common late in the thirties, the machine leapt about in different directions, finally shaking itself apart. The motor cycle engine was also used to power one or two ultra-light aircraft, one being flown at the 1923 Lympne Trials by Squadron Leader Wright. This was later used to restore a similar type of aircraft now in the Shuttleworth Collection. Navarro Chief monoplane with three ABC "Scorpion" engines, 1931. As said previously, the car engine was in fact known as the Scorpion, and with some minor modifications was flown in the 1924 Lympne Light Aeroplane meeting, but was not sold in any numbers for use in aircraft. In 1926, however, the Scorpion Mk. II was produced, designed by a Mr. Elliott, but in fact being very similar to the old Bradshaw design. This had a one-piece crankcase with integrally cast inlet manifold, plain floating bush big-end bearings in bronze, and a bore and stroke of 102 mm. x 91.4 mm., giving a capacity of 1,500 c.c. Several of these were fitted to single-seater aircraft, and proved quite a success during the late twenties and early thirties, some finding their way to Poland, Rumania, Australia, America, Germany, etc. Encouraged by this success, a similar engine was designed, but with four cylinders, known as the "Hornet". This consisted of a cylindrical crankcase in three sections, with a two-throw crankshaft housed in three bearings. The cylinder heads and pistons were interchangeable with the "Scorpion", but the cylinders themselves had an increased stroke, giving a capacity of just under four litres. A few aircraft were fitted with this power unit, but it was nowhere near as successful as the Scorpion, and little was heard of it after 1930. Lord Ridley joined the company in about 1929, and set about the design of a small auxiliary engine. This was finally produced in 1932, and consisted of a flat-twin engine with 54 mm. x 38 mm. bore and stroke, capable of operating five auxiliary units, these being a 50 amp. 12-volt dynamo, a petrol pump delivering 2,250 gallons per hour, an oil pump delivering 300 gallons per hour, a water pump at 2,500 gallons per hour, and an air compressor which would charge a 400 cu. in. air bottle to a pressure of 200 lb./sq. in. in 10 minutes. These could be operated separately or together, except the bilge pump which operated alone, and the unit was designed to be cooled by water from the main engine supply, although a small pump of its own could be incorporated. These proved useful little units, and many were installed in seaplanes, including the "Sunderland", and the Air Ministry were also supplied with over 1,000 during the last war. Lord Ridley was, of course, better known for his appearances at Brooklands with the Ridley Special. In 1938 the company took on the manufacture of constant-speed units, used in connection with variable-pitch propellers, as subcontract work from De Havilland's, and, during the war, Standard Motors also produced these units. Admiralty contracts were also undertaken for high-pressure air-valve units for torpedoes, including gyroscopic assemblies, and because of all this work the existing factory was extended. During the war about 500 people were employed, with both day and night shifts in operation. Since the war, only one engine has been produced, this being an air-cooled V-4 airborne auxiliary unit, known as the "Bee", several of which exist. Apart from this the tendency was to concentrate on precision engineering, such as toolmaking, gear cutting, and centreless grinding, although about 1952 a small department was set up to manufacture experimental and prototype electronic units and to test such gear as customers wished. In 1951 A.B.C. Motors became a subsidiary of Vickers Ltd., and they remain as such today. Of the total production of A.B.C. vehicles, the survival rate is quite good: roughly 200 motor cycles, including two Veteran models, probably about 100 Skootamotas, and about 10 cars. The Sopwith machine started numbering at 1001 and real experimental prototypes were likely lower than 1010. Models 1010A, 1010B and 1010C survive to this day and there must be a dozen or so that were used for the 1919 Show or to send to prospective dealers around the country during 1919, as production didn’t really get under way until February/March 1920. By September 1920 when Sopwith announced they were going into voluntary liquidation, it was stated that 2,200 had been made but this is arguable, and in fact the numbers stamped on the machines had reached that figure, in other words, 1,200 had been made. Sopwith continued assembling machines up to the latter part of 1921, after which agents seem to have acquired some left over stock, such as Maudes Motor Mart of Walsall who continued to register machines into 1923. There is one numbered 3,387 and this is likely a late one put together by Jarvis’ of Wimbledon who acquired much of the spares from Sopwith, and it may have a much higher number for that reason. So the total made is likely to be somewhere around 2,300. Skootamotas are the same inasmuch that no records survive, only numbers from surviving machines or registration records. The lowest recorded number is 66, and the highest 3,277 so the total is likely to be in the region of 3,300. The vast majority seem to be registered in 1920, although some are registered in December 1919, and some in 1921 or later. It would appear that about 1,500 was the total production of cars given that one surviving vehicle registered in 1926 has an engine number of 1497S and someone in Kingston had a spare engine of 1527S. There is also a Westall Special still in existance, this being a sprint car built for use in the Brighton Speed Trials just before the war. It did not compete until after the war, however, by which time it had two alternative engines: either an old 1,223 c.c. unit supercharged, or a standard "Supersports" engine, but neither were satisfactory for long at over 100 m.p.h. A note about the company’s address in Hersham. When referring to the post-Brooklands site, the Company minutes refer only to the ‘Hersham Works’ with no reference to the road, whereas those that worked there referred to it as the ‘Old Esher Road’ factory. It is likely that a number of plot or property purchases after 1914 gave the old Hersham works access to Molesey Road which certainly in later years was the main entrance, whereas at the back of the property access led on to Mole Road, itself running into the Old Esher Road. The latter was often flooded and was by-passed in the 1960s by the New Esher Road. In March 1919 the minute books refer to £9000 for factory extensions which were presumably behind Hersham Lodge. These were no doubt enlarged when the Harper Bean deal went through. It would appear therefore that there was never any direct access from the ABC works to Old Esher Road. The ‘new’ factory was acquired by the Hackbridge Company, producers of electrical transformers and cables, who in 1923 became the Hackbridge Electric Construction Company. The Hewittic Electric Co.Ltd made rectifiers, and from 1924 shared the site with Hackbridge, who in 1947 became the Hackbridge & Hewittic Electric Co.Ltd. Hersham Lodge and its adjacent factories were demolished in 1978 and the site is now the offices and research facilities for Air Products. In the preparation of this article, I would like to thank the following for their assistance: Mr. R. M. Dennis, formerly managing director of A.B.C. Motors, Sir Thomas Sopwith, C.B.E., The Royal Aeronautical Society, Flight International, M. Gustave Courau, M. Andre Jacquemin, and the many people who worked at the various company's factories.